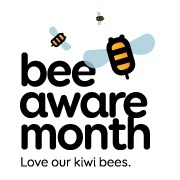 September is Bee Awareness month and this year Apiculture New Zealand are focusing on bee health by educating us on how we can feed the bees and help protect our precious bee population. Did you know that bees support New Zealand’s agri-industry exports by over $5 billion annually – that is heaps! Plus they help grow one third of all the food we eat as well as helping our gardens flourish and look beautiful. There is heaps that we can do to help out our little buzzing friends and one of the easiest way is by planting bee friendly plants and flowers. Bees need food so that they can help pollinate the food we eat. Bees will feed on pollen and nectar and this helps them to grow and Bee strong which helps them to fight off disease and parasites. Bees also need clean water so why not make a shallow container for them to drink from. Just make sure you put pebbles and twigs in the water so the bees have something to rest on while they are drinking. Another way we can help the bees is to stop spraying our gardens with harmful pesticides which kill the bees. Palmers Garden Centre who are supporting Bee Awareness Month have information and competitions on their website plus check out their 5 top tips for a bee friendly backyard. The library also has heaps of books on bees so take a look and… Lets save our bees! Who loves going to the park? I do! And I bet you do too! We are very lucky to have an abundance of wonderful parks, gardens, walkways, tracks, reserves and sports fields to enjoy in Wellington. There are parks for every occasion you can think of. Where is your favourite park, and what do you enjoy doing there? 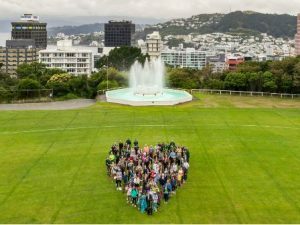 Wellington City Council’s Parks Week 10 – 18 March is an annual celebration of our parks and there’s lots going for the whole family to enjoy including Bike Krew Rodeo and the great annual Mt Victoria Treasure Hunt! These events are both free and family-friendly so make sure to bring mum and dad, and your friends along too! Parks are so important for our communities, they provide us with lovely green outdoor areas to play in, and they help keep us and our environment healthy. Show your appreciation for our cities’ great parks by heading along to a Parks Week event or by simply enjoying your favourite local park. I thought it was really interesting that it told me what you had to do in winter in America on a farm. I learned that you had to put a shelter for the bee hives in winter in America. I liked how much detail they put into the pictures. Imagine trying to find the source of a river. This book is about Uncle Egg and Clancy who are trying to do just that. Read this book to discover what adventures they have along the way. I liked this book as it was a change from chapter books and had a unique plot. Children 5+ would enjoy this book. Olly is not keen on camping, his rucksack is too heavy and his two tent mates are too happy camping. In the night however, Olly is magically transported to a glacier and Bear Grylls is his guide. What will happen next? This book was okay but it is suited for younger readers who like camping and adventure. I am not one of those people. The book would suit children learning to read. I was very very lucky enough to meet Dr Jane Goodall. She was amazing and had a toy chimp called Mr H. I have read lots of books about Jane Goodall – another good one is The Watcher. This book is not just about looking under rocks it’s about inspiring kids to go out into nature and take care of animals. Sketches are good but I would have liked them in colour. Recommend for older readers…lots of words in a little book.